We all know we should be checking our breast regularly for lumps and bumps, but how many of you actually do? And when you do, are you sure you’re doing it correctly? 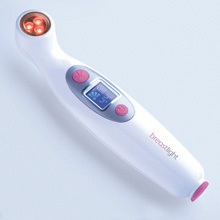 Well the breastlight aims to make sure you have no doubts about what shape your breast are in, and it does so by passing a red light through the breast tissue. The idea is that by shining the light you get to see the details inside the breast, from blood vessel to veins, and once you’re aware of what is normal, you’ll easily be able to identify anything unusual. There are a couple of factors involved in using this though. Firstly as the light used is red they advise you to go into a dark room to check it, and secondly, you should probably be using a lubricating cream with the breastlight to help it slide against the skin. There are four brightness levels to use, and once you’ve got the hang of disappearing into a dark room with a red torch and some lube you should be able to get it done pretty quickly (obvious puns dismissed here). It feels like a lot of money to spend on something that’s not strictly necessary, but if you’ve ever been shy of checking yourself, this might be the gadget for you. This is actually very useful, thinking of cancersvulst. This litemecanism makes it tranperant. Wow, this was very handy. Will send this blogpost to my girlfriend.